Having been travelling the world as a professional kiter for the past ten years, and as a super passionate surfer, I’ve been hooked on the SUP virus ever since my very first go at it. Paddleboarding has given me the opportunity to see the world through different eyes. Our pioneering sport is enabling me to enjoy my life-force – the ocean – in additional and different ways and has opened up new possibilities and opportunities for new adventures, new thrills, new playgrounds, new stokes. 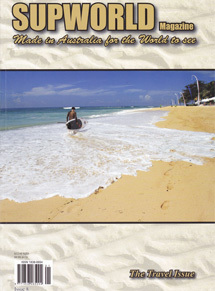 I came to experience the energy of our amazing sport for the very first time when a kite-mission with a photographer lead me to Western Australia in 2008; …and I fell in love with both: the sport and the country. Today W.A. is my adopted home-base, where I live, train and where I start my trips from and I could hardly imagine a day without picking up one of my beloved SUPs to enjoy a session in the waves, a down winder, a meditative cruise up the river or a couple of yoga moves on top of my board. 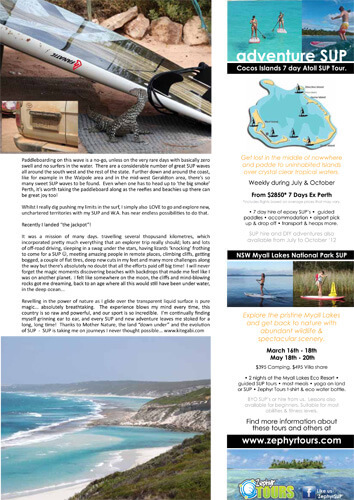 Read about both my loves: SUP’in and Western Australia in my article “SUP & The Land Down Under – A Love Tribute” in this issue of SUP World Australia, down-under’s no.1 SUP magazine!